This is a Raccoon print. Obviously the right foot is clearest. My battery died before I could take more pictures of other good examples. Raccoon prints dotted the stream shore here (where I’m typing this) at Howard Community College. I was with a few friends cleaning up the stream near Deer Run when my Environmental Science teacher, one of the women with me, pointed this first set of tracks that we saw. After that, we saw them everywhere. That and deer prints after a bit. Deer prints have what looks like two big toes and you c an sometimes see the clear impression of the hoof, the sharp edges of it. Here, with raccoons, you can see clear impressions of five toes and clearly definied toes on each of them. 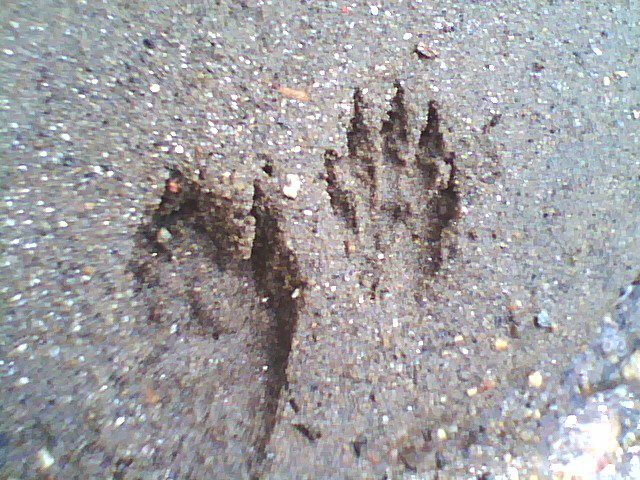 This entry was posted in Field Guides, Red Foxes (Animal Category) and tagged Deer Run, Feild Guides, Howard Community College, Raccoon, Raccoon Foot Prints, Raccoon Prints, Red Foxes, Stream Clean Up. Bookmark the permalink.